The International Financial Reporting Standards IFRS demanding a declaration of brand value - by 2011 - is certainly one of the spurs in the right direction- for nation as a whole. 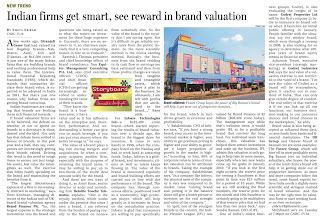 Now let me jog your mind, here we are looking at the valuation of a "X Brand's" value; the assumption being, it ( the brand under evaluation) has already been created; in all its fine detail, and, has its intangible DNA in place. What India, or, for that matter, any country aspiring to reach true greatness, needs to do: is to focus on the nurturing and encouragement of its intellectual component that's behind this process of creating remarkable intangible DNA's for its upcoming brands . Such a move would certainly keep CFO's working overtime and laughing all the way to the bank. As a precursor our nation's education system itself needs to become a much sort after brand, with its own astounding brand value and value generating capability. This in my humble opinion would be a powerful engine under the nations bonnet, and is but a part of the big-picture. The big picture being : That the lack of this is precisely what's keeping us Indians from putting China in the shade. We are talking brands here, we are talking about competing in the highest order.